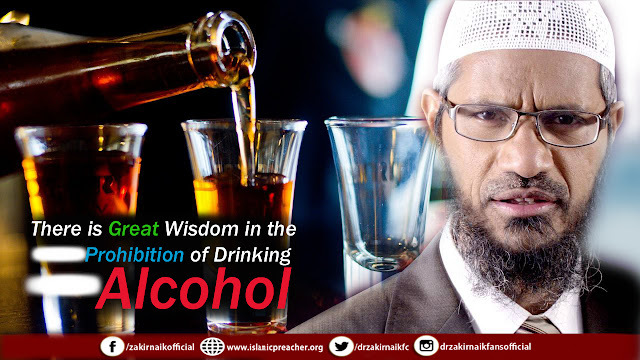 Alcohol: The word alcohol is derived from the Arabic word al-kohl, which means fermented grains, fruits, or sugars that form an intoxicating beverage when fermented. Khamr or khamrah is the word used in the Qur'an to denote a fermented beverage that intoxicates a person when he/she drinks it. It is sometimes translated as "wine." Cirrhosis of the liver can occur when a person drinks every day. Women who drink two or more drinks a day, and men who drink 4 drinks a day, are at risk for developing cirrhosis. A “drink” equals 1.5 ounces of 80-proof liquor, 5 ounces of wine or 12 ounces of beer. The liver gets used to a steady supply of alcohol, and chooses alcohol as its main source of fuel, leaving fatty acids(the preferred fuel of choice in a healthy liver) to collect in the tissues of the liver, which cuts off the blood supply to the organ. Liver cells begin to die and scar tissue is formed, deforming the liver. At the acute stage, the person will experience high blood pressure, an accumulation of fluids in the abdomen, vimoting of blood, hepititis and possibly liver cancer.